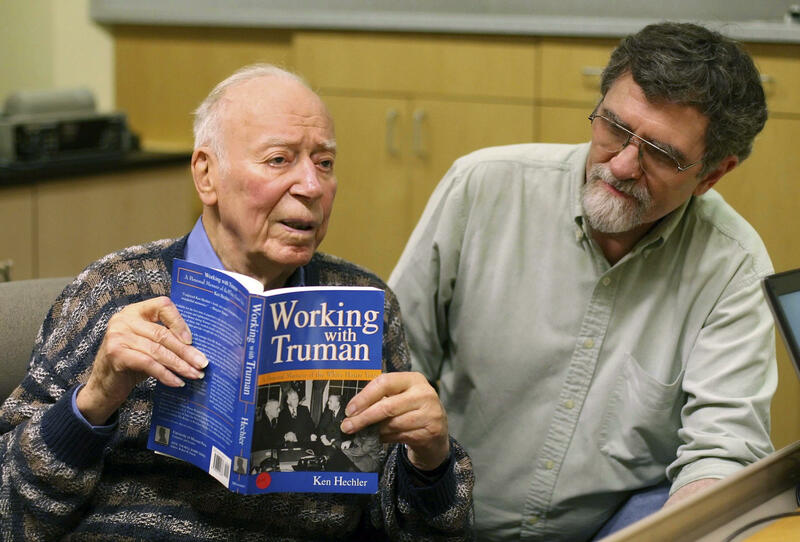 CHARLESTON, W.Va. -- West Virginia statesman and author Ken Hechler, whose seven-decade career included stints in the Truman White House and Congress, has died. He was 102. Hechler’s wife, Carol Hechler, said Sunday her husband died Saturday night at their home in Romney. Hechler served nine terms in Congress, where he championed civil rights legislation and fought for coal mine safety, strip mine regulations and black lung compensation. He later served four terms as West Virginia’s secretary of state, becoming a common sight driving around Charleston in his trademark red Jeep. “Ken was a man of his word - a fierce advocate for West Virginians who was always willing to help any person in need,” U.S. Sen. Joe Manchin said in a statement. An Army combat historian in Europe during World War II, Hechler interviewed generals and front-line soldiers. He later was assigned to interview key German Third Reich leaders before they were charged and tried for war crimes. After President Harry S. Truman’s 1948 re-election, Hechler landed research projects for the White House and eventually became a special assistant to Truman. He helped compile the official papers of Presidents Franklin Delano Roosevelt and Truman. Among his writings included “The Bridge at Remagen,” a 1955 nonfiction best-seller about a key Allied victory that became a 1969 film. Born Sept. 20, 1914, in Roslyn, New York, Hechler graduated from Swarthmore College and earned a master’s degree and a doctoral degree in history and government from Columbia University. Drafted into the Army in 1942, Hechler trained to become a tank commander, although a violation of base regulations at Fort Knox, Kentucky, pushed his career in a different direction. In a 1985 interview with the Truman Presidential Museum and Library, he said the camp general caught him writing an autobiography after lights’ out. Hechler helped chronicle the 1944 Normandy invasion, the liberation of France, the Battle of the Bulge and the drive into Nazi Germany. In the thick of all but the D-Day landings, Hechler was awarded five battle stars as well as a Bronze Star. As a captain, Hechler recalled getting a tongue-lashing from Gen. George Patton for smearing the shiny officer’s insignia on his uniform with grease to deter snipers. After the German surrender, Hechler interviewed field marshals Albert Kesselring and Wilhelm Keitel, Gen. Alfred Jodl, Foreign Minister Joachim von Ribbentrop and supreme marshal Hermann Goering, among others. Hechler returned to teaching at Princeton following his discharge. After Truman’s 1948 re-election, Hechler landed some White House research projects and eventually became a special assistant to Truman, writing speeches and other tasks, including helping the president tailor his whistle-stop train speeches. In 1957, Hechler landed a teaching job at Marshall University in Huntington and won the district’s U.S. House seat the following year. While in Congress, Hechler marched to Selma, Alabama, with the Rev. Martin Luther King Jr. in 1965. He was re-elected eight times before a 1976 failed run for governor. He was elected secretary of state in 1984. As West Virginia’s chief elections officer, his office helped uncover evidence that then-Mingo County Sheriff Johnie Owens arranged to sell his office for $100,000. Owens was convicted in 1988. Outspoken on environmental issues, Hechler ran in the 2010 special U.S. Senate race in West Virginia, largely so foes of mountaintop removal mining could register their opposition. He attracted more than 16,000 votes in the Democratic primary.